On February 7, 2019, The Barn III, a dinner theatre and event center in Goodfield, IL, celebrated their opening night. The first show, a murder mystery called “Death by Golf”, was the show Mary Simon had in rehearsal on a summer night in 2015 when a bad storm destroyed The Barn II, rendering the building unsafe. Simon moved operations to another facility, but keeping the business solvent in this new location was proving difficult. That’s when Abby Reel entered the picture. Abby Reel’s connection to the original theatre went back 20 years – attending performances and even working there before attending college. Building on her passion for this business, Reel proposed some ideas to Simon and everything started to turn around. Reel purchased the Goodfield property in 2017, including the foundation of the old Barn II as well as an old brick farmhouse and several outbuildings. She and Simon then embarked on a fundraising campaign to rebuild the Barn. This fundraising effort brought in most of their projected goal, so Reel set her sights on obtaining a small business loan. That was no easy task. She was turned down by several banks before meeting with Shelly Hunt at Morton Community Bank, who saw the vision Reel was proposing. The two saw the space as capable of not only hosting the dinner theatre, but also as a banquet hall for weddings and proms and as a meeting space for community groups. Reel also engaged Marcia Schlicht of Growth Corp to help with the financing…eventually securing an SBA 504 loan for the land, construction and fixtures. The vision is now coming to fruition, with performances scheduled throughout 2019 and weddings already booked for nearly every weekend this coming summer. 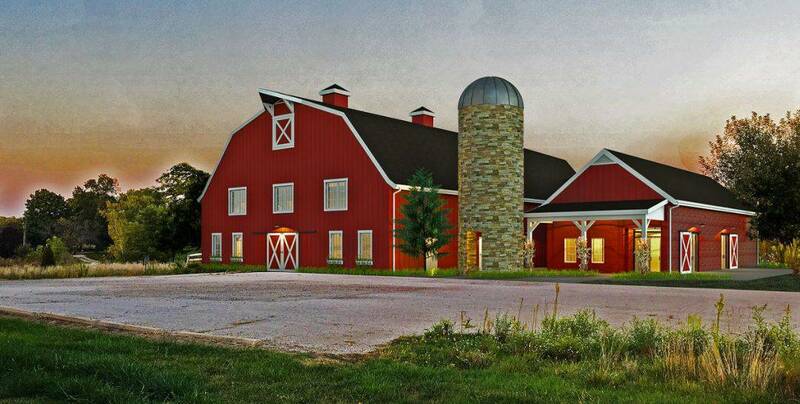 Year-round, The Barn III offers a full staffed commercial kitchen, wait staff, Head Chef and full-service bar. The facility is open to the public for events of any shape or size. Even the outbuildings on the property are being utilized for revenue streams, with dance and fitness classes being offered in one and, in the historic brick home, a future AirBNB is in the works.